N.K. says 3.5 mln asked to join military to fight against U.S.
SEOUL, Aug. 12 (Yonhap) -- North Korea said Saturday that nearly 3.5 million youths and retired soldiers have filed a request to enlist or reenlist in the military to retaliate against the United States over the latest economic sanctions adopted by the U.N. Security Council. The Rodong Sinmun, the newspaper of the North's Workers' Party, said a total of 3.475 million people, including students, young workers and retired soldiers, have asked to join or return to the military for three days after the government warned of reprisals against the U.S. on Aug. 7 for its support of the new UNSC sanctions. On Aug. 5, the UNSC voted unanimously for fresh sanctions on North Korea following two tests of intercontinental ballistic missiles in July, prompting Pyongyang to warn of a "stern action of justice" against the U.S. and a missile strike around the U.S. territory of Guam. "All the people are rising up across the country to retaliate against the U.S. thousands of times. In North Hwanghae Province, 89,000 young men pleaded to enlist or reenlist on Aug. 9 alone. In Daedong County of South Pyongan Province, more than 20,000 students, party members and laborers filed enlistment or reenlistment requests," the newspaper said. 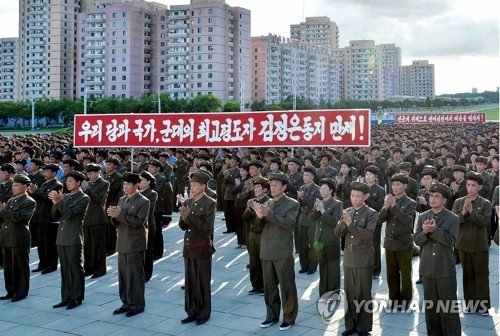 Earlier this week, Korean Central Television, a media outlet of the North, reported that North Korean youths and students were holding a string of rallies nationwide to make public their wish to enter the military. On Wednesday, about 100,000 citizens gathered in Pyongyang to support the government's pledge of retaliation against the U.S., with smaller rallies held in provincial cities later, according to the North's official Korean Central News Agency (KCNA). 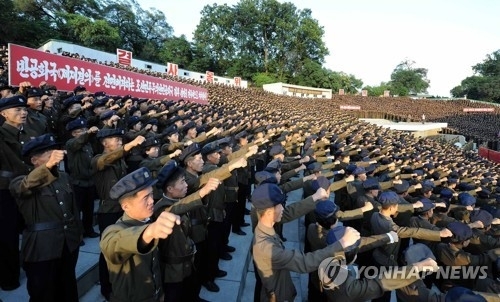 A separate KCNA report said that rallies of youth, workers and trade union members took place at the Youth Park Open-Air Theater and the compound of the Monument to Party Founding on Friday to express their "absolute" support for their government's statement, which categorically rejected the recent UNSC sanctions resolution.